There are a variety of trotting exercises you can work on with your horse to improve his and your fitness, improve the quality of his gait, or even to improve his canter. When you begin performing trotting exercises, regardless of the goal, do the exercises for a few minutes, gradually extending the time, while both you and your horse get stronger. Thoroughly warm your horse up, walking and trotting in both directions on a loose rein, before performing these more demanding exercises. 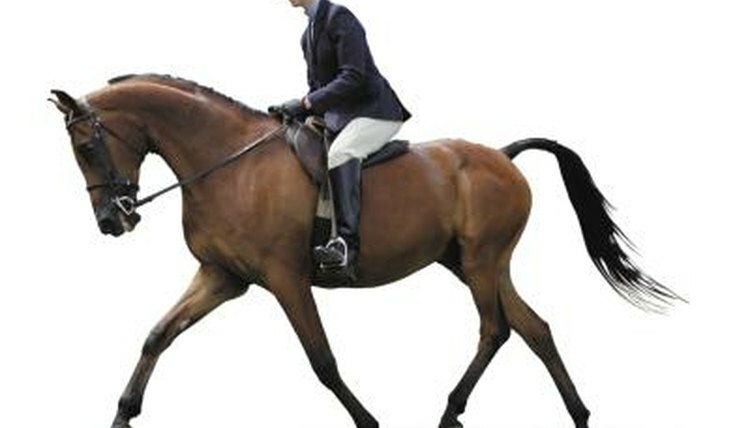 Riding the trot without stirrups is an excellent strengthening exercise for the rider. To get the most benefit of riding without stirrups, concentrate on your form. You should maintain the same position you would ride in with stirrups, with your lower leg resting lightly against the horse, not gripping your horse's sides with your thighs or knees. This is a tough exercise, so only do it for a few minutes at a time at first. As you get fatigued, your form will suffer, with your legs creeping up and your shoulders rounding forward, creating bad habits in your riding. To improve your horse's responsiveness, make transitions between a regular working trot and a sitting trot. When you begin this exercise, do several circles of each gait between transitions. As your horse becomes stronger and better at listening to you, complete one half circle at the working trot and one half circle at the sitting trot. Trot poles help strengthen your horse's hocks, improve his flexibility and teach him to be more responsive to your aids. You benefit from working over trot poles by learning to stay off your horse's back and follow his motion in a relaxed and natural manner. When working with trot poles, it is helpful to have a person on the ground to make sure the poles are properly spaced and to straighten them if your horse accidentally kicks one while trotting through. Place the trotting poles between four feet and five feet, three inches apart. Expect to make some adjustments initially until you learn what distance works best for your horse. He should trot through the poles easily, neither mincing his steps or having to stretch to put his feet down between them. Start with three poles, adding more as he becomes more comfortable. You can use the trot to improve the canter. Start by establishing a working trot in a large circle. If you are in a riding ring, use half the ring for your circle. If you are in a field, a circle about 20 meters is a good size. Once you have established a rhythmic trot, ask for the canter. Canter for approximately half of the circle, then move back down into a trot. Wait until your horse is established at the trot with an even, steady stride, and ask for the canter again. Repeat the trot-canter transition several times in each direction.